When President Donald Trump entered the White House in January, he made the controversial decision to make Steve Bannon a senior adviser and give him a seat on the National Security Council. In the past, Bannon, former editor of the far-right Breitbat, was accused of antisemitism by his ex-wife, and allegedly made homophobic remarks about feminism. There are also his troubling ties to Russia, which, coupled with the fact that Trump enlisted the help of Russian firms and bots to help him win the election, makes everything even more troubling. But his days are over according to multiple sources quoted by The New York Times, MSNBC and even The Drudge Report. His departure is possibly the result of an interview he gave to The American Prospect, a progressive publication, in which Bannon called white nationalists a “collection of clowns” and seemingly spoke out about President Trump's blows with North Korea. Though according to journalist Sara Carter, Bannon says he left of his own accord. Which we're totally willing to believe and probably has nothing to do with the negative press Trump was getting and rumors that Bannon wasn't happy with the way Trump was running things. Breitbart seems to be going with the same story. Yep, nothing to see here. Totally normal. People resign from high-profile government positions of power for no reason all of the time. Especially people like Steve Bannon. According to CNN, White House press secretary Sarah Huckabee Sanders confirmed Bannon's departure from the White House, but did not specify whether he resigned on his own accord or was fired. Whatever the reason, Twitter seems pretty happy to see Bannon go. Congratulations, everyone who had Steve Bannon as the next Confederate monument to go down. I like redemption stories so maybe Steve Bannon can do something more worthy with his life, like maybe deal meth. 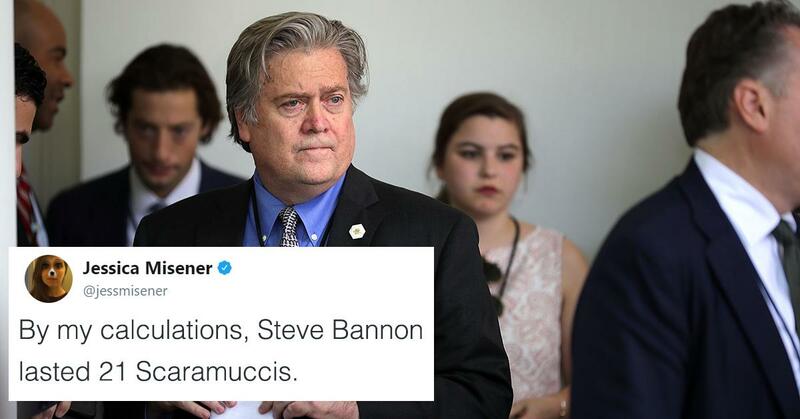 Steve Bannon can change his title from "WH Chief Strategist" to "Racist Old White Dude" now. At this point, you can't help but wonder who's going to go next.